Very simple kabobs are made clever with an easy relish added after grilling is done. Heat barbecue to medium-high heat. Reserve 2 Tbsp. dressing. 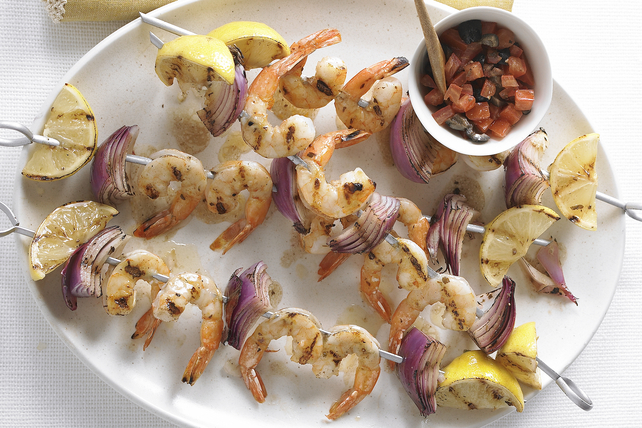 Thread shrimp, onions and lemon wedges onto 4 skewers. Brush with remaining dressing. Grill 6 to 8 min. or until shrimp turn pink, turning occasionally. Meanwhile, mix reserved dressing with olives and tomatoes. Serve kabobs topped with olive mixture. Prepare using Kraft Extra Virgin Olive Oil Sun Dried Tomato Dressing. These colourful kabobs can be part of a healthful eating plan.